Parents help ease the transition from summer fun to school routine. Just as important (but perhaps not quite as much fun) as shopping for the right back-to-school fashion, parents can encourage positive health and ergonomic practices that reduce their children’s risk for developing repetitive strain injuries. Several years ago, a youngster was referred to our hand therapy clinic with classic and debilitating symptoms of Carpal Tunnel Syndrome (CTS). However, the physician, a generalist, was adamant that this young person did not have CTS as “16 year-olds do not develop these types of injuries”. This patient’s parents sought a second opinion. The patient was officially diagnosed with CTS upon physical examination with an orthopedic hand surgeon and nerve conduction examination, subsequently underwent surgical decompression of the nerve, and had a very successful recovery. It is true that we don’t see many pre-teens and teenagers with symptoms of repetitive stress injury. The flexibility and rapid healing rate of children allow them to get away with much more than adults when it comes to the repetitive and forceful nature and awkward postures of physical activity that create symptoms. Unfortunately, the increasing role of technology in our lives, across all age groups, can not be ignored. And formal classes in typing technique, posture and ergonomics are no longer offered in school as children begin using technology in their toddler years rather than learning to type in high school. It is important for adults to be aware of the risk factors and to teach good ergonomic principles and work practices to our children in order to help keep the next generation pain-free. In a series of international studies, up to 60% of students across the globe reported eye-strain, neck & shoulder pain, wrist and back discomfort, headaches and fatigue. Symptoms were reported in children as young as in 4th grade.Repetitive strain injuries in children are highly correlated with the repetitive, awkward and prolonged postures they are using when they are working on computers or laptops. The portability of technology (e.g. laptop computers, video game players, mobile phones, iPads) allow for use in non-traditional settings and with non-traditional postures (for example, slouched in a couch or lying on a floor) that can increase the risk of injury. Provide children the skills to understand what is good for their bodies so they can make good choices for themselves. Teach healthy computer habits which can be carried into adulthood. Encourage physical activity. Children who exercised during breaks from computer use had fewer pain complaints then those who were sedentary. Encourage healthy habits including drinking plenty of water for tissue hydration and eating a variety of nutritious foods. Chairs should be adjustable allowing for easy changes for growing children or for various family members of different ages and sizes. The best chairs should have adjustability for chair seat height and depth. The back of the chair (providing lumbar support) should be able to be pushed forward. If the chair is not adjustable, use pillows or cushions to raise the child to the appropriate height or to support the back. Position the child so that the eyes are level with the top of the monitor screen. The monitor should be placed directly in front of the child at about an arm’s distance away (about 12-14 inches) to prevent eye and neck strain. Shorter legs should be supported on a footrest, sturdy box, or stack of stable books with hips, knees and ankles at about 90 degrees. There should be about 2 inches of clearance between the back of the child’s knee and the chair seat edge. Increase type font on the monitor so that it is clearly visible to the child so they don’t have to squint or lean forward to read the screen. The screen should be clean and the brightness and contrast adjusted for easiest reading. Reduce screen glare by placing the computer perpendicular to windows, having good room and task lighting, and, if necessary, using an anti-glare screen. Teach your child to look away from the screen after every 15 minutes or so of typing to ease eye-strain. Lower or remove chair arm rests so that child’s arms are loosely held at the side of the body, elbows bent at about 90 degrees, and the shoulders relaxed. Place the keyboard and mouse within easy reach of the child so they do not have to stretch the arms out to use them. Wrists should be flat and straight (in the neutral position) with fingers relaxed. Teach the child to use the lightest touch possible on the keyboard. Encourage the child to sit upright and not to twist, slouch or crouch in the chair while typing. Encourage a typing break of 5-10 minutes for every 30-40 minutes of typing. Preferably the break activity should be active. A timer can be used to help the child learn to monitor himself. The American Society for Surgery of the Hand has published some good tips on avoiding a hand injury while preparing your Thanksgiving meal (ASSH.org; Turkey Carving Safety). But…. what if you already have hand pain from a tendinitis, or arthritis, or carpal tunnel syndrome, or a recent hand or wrist sprain/fracture/injury? Anticipating a full day of hand intensive activity when you are already in pain can be intimidating and anxiety-producing. Here are some survival tips to help those with hand injuries host the big event without increasing pain. Ask for help. Although this seems like common sense, it is often hard for a host to request help from his or her guests. However, most family and friends would be more than happy to lend (a literal) hand. And don’t some of the best holiday moments actually take place in the steamy, fragrant kitchen? Generate a party atmosphere -sipping something bubbly while chatting and sneaking food tastes- all while sharing the tasks of chopping, stirring and dish washing. Enlist someone who is strong and injury-free to lift the turkey out of the oven or perform the turkey carving. When someone offers to help with the dishes, accept gracefully. Cut corners. Less work=less hand stress=less pain. Thanksgiving should be about enjoying time with family and friends. However, often Thanksgiving becomes all about the food. Large quantities of food. So much food, that we are obligated to overeat. Be creative in finding ways to minimize the amount of work you actually need to do. Would anyone really be heart-broken if there were fewer dishes on the table (as long as Mom’s famous stuffing is front and center)? Would anyone know if you used onions that were purchased already chopped? Or if that apple pie was made from pre-sliced apples and prepared pie dough? Or, better yet, bought at a local bakery? How about throwing tradition out for one year and planning a potluck? Or purchasing a packaged dinner from the grocery store? Could you use bottled gravy? Can the butcher pre-cut the turkey so that smaller and lighter pans can be used for cooking? Or, if it’s a small gathering, how about purchasing a turkey breast rather than the whole beast? Preparation is key. Plan ahead so hand intensive and possibly pain producing activities can be spaced out. Design a menu that allows you to perform some early meal preparation over the 2-3 days preceding the holiday. Include house cleaning tasks and preparation into your Thanksgiving plan as well. Perform heavier activities early in the week and complete only 1-2 a day. The more you can pace your activities, the less physical and emotional stress on Thanksgiving day. Gadgetize. Dust off those kitchen tools. Use food processors, electric can and bottle openers, even an electric knife to reduce physical stress on the hands. Minimize. Ease stress on the body by following some general principles of joint protection and energy conservation: use leverage rather than grip (such as those “Y” shaped bottle openers); push rather than pull; slide rather than lift (use a dish towel on the counter to slide heavier pots and pans closer to the stove so you don’t have as far to carry them); use comfortably bigger and cushioned handles (the Oxo kitchen tool line is a good example). Be practically festive. Bring in some holiday cheer with a themed paper tablecloth and napkins (less laundry) and sturdy, decorative paper plates and paper or plastic glasses and stemware (fewer dishes). Take time to care for yourself. If, in spite of all your preparation and planning, your hands are more painful or swollen by the end of the day, sit for a few minutes, put your feet up and apply a cold pack. Perform only the most necessary clean up. And aim to have a relaxing day the following day. Intending on carrying a bunch of shopping bags on Black Friday?….although fun, perhaps not the best timing for the hands. Wishing you and yours a healthy and happy Thanksgiving. 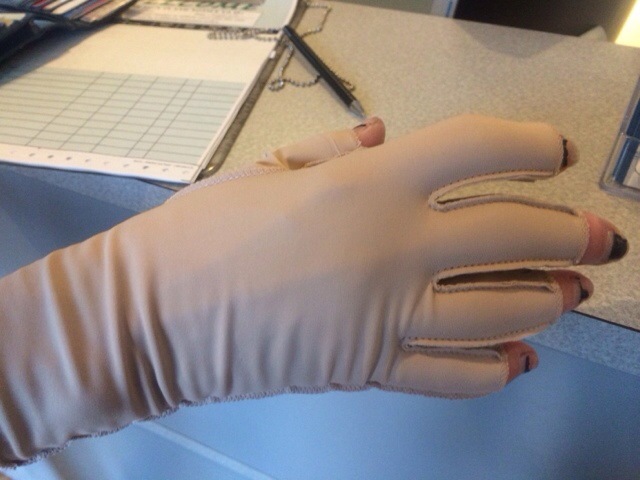 Compression gloves are often recommended for a swollen hand or finger. The blend of nylon and lycra provides a comfortable, gentle squeeze that helps reduce swelling. These gloves are thin and unlined so that they move with the hand and do not get in the way of hand use. You can often purchase the gloves without tips (3/4 finger length) so that you have sensation and better purchase at the ends of the fingers for easier hand use. The seams of these gloves are deliberately placed on the outside of the glove to provide a smooth and even fit, to increase comfort, and to prevent pressure areas and friction. The gloves also provide a low-level warmth that can be comforting to painful and stiff finger joints. The hands can be at risk for frostbite when temperatures drop below 20 degrees Fahrenheit. With the sub-zero temperatures many are experiencing this week across the nation, here are a few tips to help you prevent a cold-related hand injury. 1. Wear appropriate clothing for the weather. Wool or a wool synthetic is warmer than cotton. Mittens are more protective than gloves. Insulate with several thinner layers of clothing rather than only one or two thicker layers. Top with a waterproof outer layer. Carry extra pairs of gloves with you in case the ones you are wearing become wet. 2. Check to be sure that no area of skin is exposed (for example, where the glove and the arm sleeve meet). 3. Check the fingers for signs of frostbite on a regular basis if you need to be out in the weather for any length of time. 4. Avoid use of alcohol or cigarettes. Both increase susceptibility to developing frostbite. Certain medical conditions (for example, neuropathy, diabetes, peripheral vascular disease, Raynaud’s) and medications can also increase risk of developing frostbite. Take extra precautions if you have a condition that puts you at higher risk.